On September 24, Fromagination participated in a fundraiser for the No Kid Hungry campaign to provide funds to help end childhood hunger in Wisconsin. With Emmi Roth USA cheese, Sysco Baraboo , and Stephan & Brady in Madison as our partners, we made, sold and delivered hundreds of sandwiches. 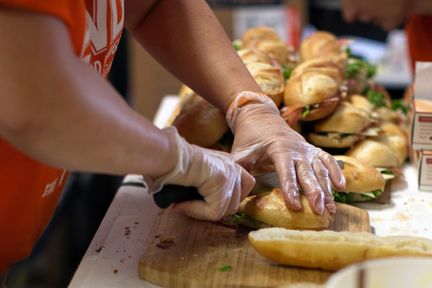 And for each sandwich, we made a $3.00 contribution to No Kid Hungry. No Kid Hungry connects kids in need with nutritious food and teaches families how to cook healthy, affordable meals. For more information about the No Kid Hungry campaign, check www.nokidhungry.org.